Rolling out the red carpet, so to speak, with classic elements including a curvaceous camelback profile, pleated roll arms and scrolled, exposed frame, this luxurious oversized chair lets you bring home the royal treatment well within budget. 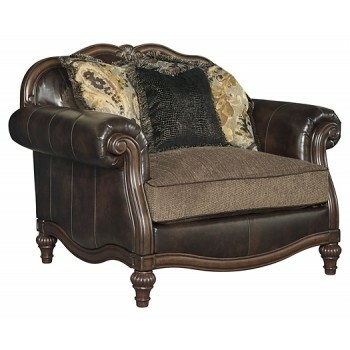 The style is clearly inspired by yesteryear, but the feel is modern comfort at its best. Masterful mix of designer back pillows in lieu of a traditional cushion is wonderfully indulgent.